City Plaza, the “best hotel” in a Europe of fences and rising racism, is facing today major financial difficulties. The international fund-raising campaign and the direct donations -which were so successful in the first year of the project- have decreased severely. Therefore, we appeal once more to all the individuals and groups who have made City Plaza possible through their contributions. 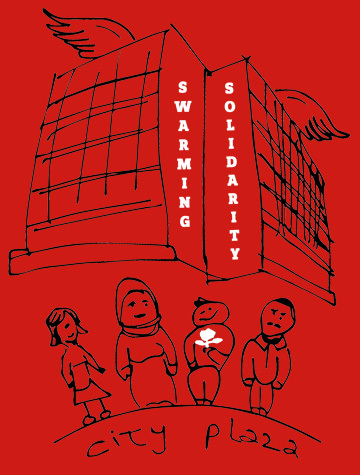 We ask for local groups and initiatives to spread the message and organize solidarity events and parties. We ask for collectives or private individuals to join our campaign, to share our videos and our call to keep City Plaza alive. So far, for around 20 months, City Plaza has managed to be a house of dignity, safety and struggle for more than 1.700 refugees -more than a third of them babies and children. This is due to the endless effort of hundreds of activists, through solidarity and self-organization, but this wouldn’t be enough without our donor’s support, without your support. City Plaza is an entirely voluntary effort, without any paid staff or public funding. But it takes significant resources to run. At the moment, City Plaza is at an important crossroad. Even though the expenses, when compared to those of the official camps are over 1/5 less, fresh food and heating oil take up a large portion of City Plaza’s budget. There are also many other expenses — baby care products, medicine, laundry, school materials, cleaning and hygiene products etc. City Plaza is in need of your solidarity in order to continue to run as a living alternative to the dominant European migration management in Greece. Keep the “best hotel in Europe” open! On April 22, 2016, 250 activists and refugees took over the hotel City Plaza in the center of Athens. A hotel which like many other businesses stood closed for more than 6 years after the economic collapse and the government’s policies of austerity. This abandoned hotel was transformed into a Refugee Accommodation and Solidarity Space. Since then the solidarity initiative has, for more than 600 days, provided free and decent housing to over 1700 people in the very center of Athens, irrespective of their nationality and residence status. These people are housed in the hotel’s 120 rooms, 350-400 persons at a time. City Plaza emerged as a direct response of the solidarity movement to the disastrous effects of the EU-Turkey Deal and the militarized closure of the Balkan Route. City Plaza was squatted in order to provide displaced people a safe and dignified alternative to the miserable, unhygienic, cruel conditions of the refugee camps, the hot-spots and the detention facilities. In doing this, City Plaza stresses a clear political message: decent living conditions for everyone is possible, even in a country as burdened by crisis as Greece. At the same time City Plaza has become a hub of transnational solidarity and struggle against the EU migration regime. A space of common living but also a space of struggle against the new forms of exclusion and repression emerged after the “long summer of migration” in 2015. We stand for the freedom of movement and the right to stay, against the EU ’s cooperation with the authoritarian and repressive regimes in Turkey and Libya. We condemn the re-implementation of illegal push-back practices by the Greek government and we fight against the entrapment and the horrible living conditions for refugees at the east Aegean islands.